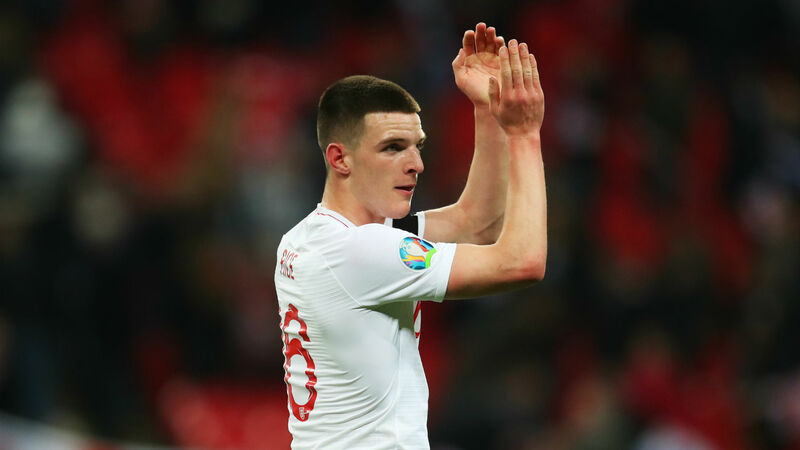 Eric Dier's hip injury during the early stages of Friday's 5-0 thrashing of the Czech Republic could open the door to a first England start for Declan Rice. West Ham midfielder Rice made his Three Lions debut from the bench as Raheem Sterling's hat-trick inspired an emphatic opening to Euro 2020 qualification for Gareth Southgate's side at Wembley. The 20-year-old, who has switched allegiance from the Republic of Ireland, had been tipped in some quarters to start at the base of England's midfield, but Southgate opted for the international experience of Dier and dropped Jordan Henderson back to the holding role when Ross Barkley replaced the stricken Tottenham man. "It's just a bit of a problem around the hip area, so he's not going to be right for Monday," Southgate told reporters, looking ahead to the Three Lions' next Group A assignment in Montenegro. "It's best that he gets back to his club now." Rice was the subject of pre-match controversy when old social media posts emerged of him apparently showing support for Irish Republican terrorist group the IRA. He apologised for any offence caused and was given the backing of his manager, who insisted the decision to send Barkley on initially was purely tactical. "We felt, having started the game the way we did, that Barkley was a better option at that moment in the game," Southgate said. "He's a bit more of an attacking player, and I think we were not moving the ball through midfield as well as we wanted to, so that was the decision there." Rice came on to enjoy a pressure-free debut alongside Callum Hudson-Odoi after Sterling had put the game to bed and was granted a largely positive reception from a buoyant home crowd. "The third goal meant that he could enjoy it and breathe a little bit more when he went in, so it was a perfect game for him to come into, really, at that point, and similarly with Callum," Southgate said. "I think he had an opportunity then to go and play with the freedom that he's shown all week, and I thought he displayed that." Asked whether Rice was an option to start in Dier's stead in Podgorica, Southgate answered in the affirmative and ruled out calling for any replacements at this stage. "Yes, I think we've got some good options to play players in different positions, so our intention at the moment is to go with the squad that we've got," he added. "But we need to just check on the rest of the players over the next day or so to make sure there's no issues."